Hiya jammers, MisterChunkybuddy here! Sorry this post is late, I have spent all morning drawing Tavie the dolphin alpha and Rio. This is the result. I think Tavie is a pretty awesome alpha. I wish AJHQ tells us more stuff about her and her Jolly Oyster band. Remember that post about how I think ocean alphas could be (Click here) that I did a while ago? But I like Harvey, maybe I will do a better drawing of him sometime. And who else do you think is on the Jolly Oyster? Probably Marco and Harper, as they are also underwater alphas. Harvey and Rio play the trumpets, Harper the underwater drum kit, and Marco the underwater grand piano. And of course, Tavie the Nautilius guitar. Haha, after writing this I want to do a drawing of the whole band XD Maybe I will. Well, now let's get above sea level and have a look at the new item! Talking about the Crystal Palace, here is how I decorated my boat! As it is Tuesday, it is Oufit Idea day! This week's idea is a weirdo hippie crazy look that you can achieve with dreadlocks, tye dye, scarf and sandals in matching colors. Here are some pics of how it looks on different animals! Haha, I invented it when I was messing around with my penguin and though this was a really funny outfit. Last but not least, the featured comment! Yep, anonymous is right, I should do a party. Any suggestions for date and time? So yep, three million views! That's a lot, I can't believe it! I never though my blog was gonna become this popular. 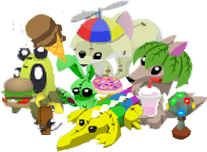 "Wow, it must be like really awesome when your blog has lots of views and people read it and comment, and say hi to you around Jamaa"
Blogging is so fun and Animal Jam has really changed my life. Thanks so much everyone, it means so much just for you to be there and view and comment. 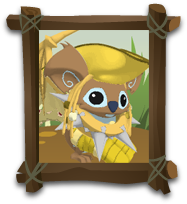 Now for the Rare Item Monday, which is at the summer carnival. Not enough gems either. But why #8803? Phantoms are sooo mysterious. Also, I wanna thank awesomepanda868 for making this epic banner! Click here to see her awesome page. And as always, last but not least, here is the featured comment! Yes, I have been thinking of having a party. When do you think I should do it, jammers? This is a post to tell you that web reached 3 million hits. Unfortunately I dont haber time right now because un an hour Im gonna go back home from my vacations (perfect timing XD) so i dont have much time and im writing this on my phone. So when I get home later today, im gonna make a big post about the latest news on AJ, and probably a few pics from my vacation. Thanks a lot to everyone who has ever viewed this blog. Hiya jammers! I know I said I was gonna keep up with posting, but we've had to do something weird with our home wifi which involved loads of cables and stuff, and the wifi not going. But now we finished I think it's supposed to go much better. Anyway, I'm posting to tell you that I'm going on vacation for two weeks, and won't have internet connection.